A trial truck modeled after Tatra 813. It is very capable and masters all terrains! INSTRUCTIONS INCLUDED! When I started building it, I thought, do I really want to build ANOTHER Tatra? Well, yeah! Tatras are great. So as I built it, it got better and better until it achieved my goal- being a good looking and capable truck. I like it. The truck has some wide range of suspension travel. It uses an independent suspension on all the wheels. Actually it’s half swinging axles, the typical Tatra suspension. I have also made instructions for it! you can find them at the Instructions page http://yoraish.wordpress.com/instructions/ . The video: I tried making it similar to an official Tatra video, enjoy! Good creation! Video is also well made! 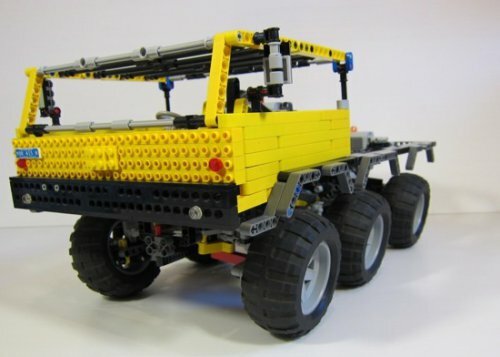 How Many technic triangles does it use? I used about 40 of those at least.